ICSA Chartered status is your passport to career opportunities across the world. It is the internationally recognised benchmark for governance professionals and a standard that is upheld across ICSA’s international divisions: Australia, Canada, Hong Kong/China, Malaysia, Singapore, Southern Africa, New Zealand, UK, Ireland and Associated Territories and Zimbabwe. Employers in many jurisdictions recognise and welcome the proven skills and experience that Chartered Secretaries and Governance Professionals can bring to their organisation. This is especially true of highly regulated sectors, such as financial services, where ICSA qualifications are often essential to an employee profile. Living and working overseas can be personally and professionally rewarding. It’s an adventure full of new experiences with different people, cultures, climates and places. It often involves a change of pace and requires a steep learning curve as you adapt to your new life at home and work. Working in another country can offer scope for professional development that is not readily available at home which broadens your expertise, interests and contacts. The fact that you have lived and worked in another jurisdiction not only shows professional breadth but can also demonstrate positive personal qualities such as curiosity and resilience to future employers. It will also open up your horizons, with one successful international move potentially increasing your interest in and eligibility for another. Robert Ford FCIS, Executive Director of Governance Gurus FZE which is headquartered in the UAE, explains how relocating abroad created new opportunities for him. 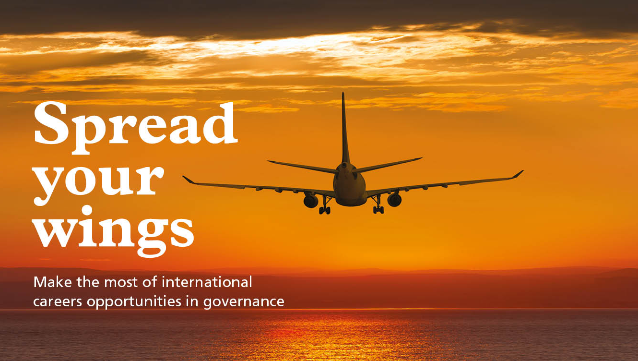 ‘Living and working overseas enables you to gain corporate governance and company secretary expertise across different entity types and jurisdictions. Over the last 10 years in the Middle East I have had the opportunity to work with professional firms, family businesses, government entities, not-for-profit organisations and started two businesses. During this time, I led one transformation project spanning 13 regional countries and advised on governance structure, policies, processes, system and technology. I also reviewed and enhanced the governance framework and policies of a large group with an annual revenue of over $1 billion. possible through the enhancement of my regional and international expertise in corporate governance, company secretarial practice and board effectiveness since living and working in Dubai’. It is not simply a question of broadly weighing up the pros and cons. You need to be very well informed about your particular destination and its suitability for you and, if you have family and pets, for them too. Source Recruitment Specialists in Guernsey, make this point to candidates seeking to relocate. Steve Duckworth, Senior Recruiter, says, ‘Guernsey is a fantastic place to live and work with a thriving private equity industry and a wonderful environment. We encourage candidates to consider all the factors that will surround their new role as these will determine their happiness, well-being, and ultimately their success. For example, candidates need to take into account the differences between city life and living on a small island which has a different momentum, cost of living, and where the weather will influence their travel plans’. her daughter was used to was available, to making arrangements to employ a nanny in England who was prepared to accompany the family for the first year of their relocation. Another important thing to do is to research the cost of living in your new destination, to make sure that the move will stack up for you financially. It is also advisable to give yourself a safety net, putting some cash aside just in case circumstances change through illness, political unrest or natural disaster and you need to come home. Once you arrive, your learning will continue and it is extremely helpful to think about how you orient and present yourself. You also need to consider how you behave socially too. Jenny says, ‘the best advice I was given was to avoid getting drawn into discussions about politics, economics or local culture. First impressions last and it’s useful to remember that you are a guest in someone else’s country. With an open mind and some humility you may be surprised at the new friends you make and skills that you learn’. Start with ‘why?’ Focus on what you want to experience and achieve by moving country. This will define the where, what and how of your relocation. Visit your destination. Find out what it is really like and if you can see yourself living there. Understand the legal system. Do you need a visa? What will your rights be as an employee? Will your partner or spouse be able to work too? Should you register with your consulate? Do your sums. Research the cost of living and tax regime in your proposed country to make sure that the move will be financially viable. Start building a network. ICSA groups, LinkedIn and other forums will help you to access local intelligence and support. Ask how your future employers can support your preparation and transition.